Draft: 2012, Boston Red Sox, 2nd rd. Graduated from Dillon High School in Dillon, SC in 2012...Was named the 2012 Gatorade South Carolina Baseball Player of the Year...went 7-1 with one save, a 0.89 ERA and 113 strikeouts in 50.0 innings for Dillon as a senior... also hit .439 with five home runs and 32 RBI... Committed to play collegiate baseball at South Carolina before being drafted by the Red Sox...In 2011, Callahan played in the Under Armour AllAmerican Game at Wrigley Field. Appeared in seven games for triple-A Las Vegas in the Mets organization...was placed on the 7-day injured list on April 22 and had right shoulder surgery in June...Did not make his season debut until July 30. Acquired from the Red Sox along with RHP Stephen Nogosek and RHP Gerson Bautista in exchange for RHP Addison Reed on July 31...Had his contract selected from Las Vegas (AAA) of the Pacific Coast League on September 1... Made his major league debut on September 2 at Houston in the first game of a doubleheader...Closed out the season with 3.1 scoreless innings over five appearances...Was unscored upon in seven of his nine outings...Lefthanders went 2-14 (.143) and righthanders were 5-14 (.357)...Struck out 66 batters in 52.0 minor league innings (11.42 strikeouts per nine innings)...Went 1-1 with one save and a 1.80 ERA (two earned runs/10.0 innings) in nine games with Las Vegas (AAA) of the Pacific Coast League...Was 5-2 with a 3.21 ERA (15 earned runs/42.0 innings) with 56 strikeouts in 32 appearances between Portland (AA) of the Eastern League and Pawtucket (AAA) of the International League. Enters the 2017 season ranked by Baseball America as the Red Sox' No. 28 prospect. Converted to a relief pitcher during the 2015 season...In 56 appearances-all in relief-from 6/11/15 through the end of the 2016 season, posted a 2.88 ERA, a .217 opponent AVG, and 9.25 SO/9.0 IP (121.2 IP, 97 H, 39 ER, 125 SO). In 2015 and 2016, held RHH to a .208 AVG (69-for-331) and allowed only 1 HR to LHH (269 AB). 2016: Made 36 appearances for High-A Salem, his 1st full season as a reliever. Ranked 3rd among qualified relievers in the Carolina League in opponent AVG (.218) and was 5th among relievers in S0/9.0 IP ratio (8.63; 63 SO/65.2 IP)...Also ranked 1st on the team in saves (7) and in holds (5). Allowed only 1 HR in 65.2 IP...Held RHH to a .197 AVG and a .569 OPS (24-for-122, 0 HR). Recorded at least 1 SO in 31 of his 36 relief appearances...22 of his 36 appearances were scoreless, including 13 of his last 15...Made 6 consecutive scoreless appearances from 7/14-8/2 (10.2 IP). Following the season, posted a 0.75 ERA (1 ER/12.0 IP) in 12 appearances for Surprise in the Arizona Fall League. Made first six appearances as a starter before spending the rest of the season as a reliever... Went 7-3 with three saves and a 3.06 ERA (23 earned runs/67.2 innings) as a reliever...Did not allow a home run to a lefthanded batter (148 at-bats). Made 25 starts with Greenville (A) of the South Atlantic League...Struck out 89 and walked 66 in 108.2 innings, the most innings he's thrown in any season of his career. Was the youngest pitcher (19) to make at least 10 starts in the New York-Penn League...Earned consecutive NYPL Pitcher of the Week honors (7/22-28, 7/29-8/4) after allowing one hit and striking out 17 over 12.0 scoreless innings in that span, including 6.0 perfect innings on July 31 vs. Auburn. 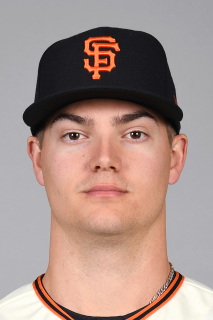 January 24, 2019 San Francisco Giants signed free agent RHP Jamie Callahan to a minor league contract and invited him to spring training. January 24, 2019 RHP Jamie Callahan assigned to Sacramento River Cats. November 2, 2018 RHP Jamie Callahan elected free agency. November 2, 2018 New York Mets sent RHP Jamie Callahan outright to Syracuse Chiefs. October 2, 2018 New York Mets recalled RHP Jamie Callahan from Syracuse Chiefs. April 22, 2018 Jamie Callahan roster status changed by Las Vegas 51s. March 13, 2018 New York Mets optioned RHP Jamie Callahan to Las Vegas 51s. September 1, 2017 New York Mets selected the contract of Jamie Callahan from Las Vegas 51s. July 31, 2017 RHP Jamie Callahan assigned to Las Vegas 51s. May 11, 2017 RHP Jamie Callahan assigned to Pawtucket Red Sox from Portland Sea Dogs. April 1, 2017 RHP Jamie Callahan assigned to Portland Sea Dogs from Salem Red Sox. January 31, 2017 Boston Red Sox invited non-roster RHP Jamie Callahan to spring training. April 5, 2016 RHP Jamie Callahan assigned to Salem Red Sox from Greenville Drive. February 29, 2016 RHP Jamie Callahan assigned to Boston Red Sox. November 9, 2015 RHP Jamie Callahan assigned to Scottsdale Scorpions. June 1, 2015 Greenville Drive activated RHP Jamie Callahan from the temporarily inactive list. May 28, 2015 Greenville Drive placed RHP Jamie Callahan on the temporarily inactive list. April 1, 2014 RHP Jamie Callahan assigned to Greenville Drive from Lowell Spinners. June 13, 2013 RHP Jamie Callahan assigned to Lowell Spinners from GCL Red Sox. June 18, 2012 Jamie Callahan assigned to GCL Red Sox. June 15, 2012 Boston Red Sox signed RHP Jamie Callahan.